I’m not a great sleeper. Sleep has been one of the few casualties since my experiences with severe depression and anxiety during my teens and early twenties. Whilst everything else has recovered well, sleep is taking that bit longer to resolve so the phone doesn’t wake me when it rings at 4am. 21 year old Eric’s name flashes across the screen. We have been sharing e-mails over the last couple of weeks and one phone call. From his first mail, it was obvious Eric was in a dark place in his life. It’s obvious from the tone and emotion in his voice on the phone now that the darkness has finally emptied his reserves of fight and flight has now become a very real possibility for him. His family took him to the A&E department a few hours ago because he told them he was feeling suicidal. A couple of hours later, he is discharged with an appointment to see a psychiatrist in 3 weeks. Instantly, I’m reminded of a conversation I had with a friend of mine recently who is a member of the Garda Siochana. He explained to me of how he is sick and tired of getting calls to family homes in the middle of the night and bringing a person who is in a distressed state to an A&E Department and a few hours later, receiving another call and cutting the same person down from a tree or pulling them out of a river. Eric doesn’t have three weeks now. He may not have three hours. We chat over the phone as the darkness turns to dawn outside. I tell Eric about Pieta House. How I was invited by Joan Freeman to visit their new Pieta House in Cork City and how I instantly fell in love with the place and why I did. When my parents were taking me to see various different psychiatrists during my difficulties, I always disliked the atmosphere and coldness that permeated these buildings and nothing reflected this better that the white walls and blinding white lights in the ceiling of these offices. You almost felt like you were a product being brought in to a sterile cleanroom in a lab, about to be inspected and dissected by some ‘expert’ who would find what fault you had, produce a fancy and intellectual sounding label/diagnosis that would keep them happy but be never adequate to reflect the immense depth within each human being. I explained to Eric the warmth of Pieta and it’s staff, how the therapist sits on a soft chair that results in them looking up to you, almost in an act of worship at your courage in sharing your story, how the building is like a family home with warm light and even warmer people. There are no ‘experts’ in Pieta on another person’s life or their solutions to it, or at least I hope there are not, but people who will sit, and listen, and be with you during this difficult time in an unconditionally loving and non judgemental way. Eric has been through the Pieta system now and it has helped him to emerge from his period where he didn't wanted to finish his life but to end the immense darkness and pain he was engulfed in. Eric has a long road ahead of him that will be full of rich and difficult but ultimately liberating learning. Because of Pieta and a support group around him, he now carries that magical ingredient that sustains us all at periods during our life, he has hope back in his life again. Niamh Connolly, Lorna Ferncombe, young Ruairi Conway and all the other volunteers and people of Dungarvan should be very, very proud of themselves this weekend. Dungarvan is a town that is riven with anxiety and worry at the moment with the high rate of suicide it is currently experiencing. 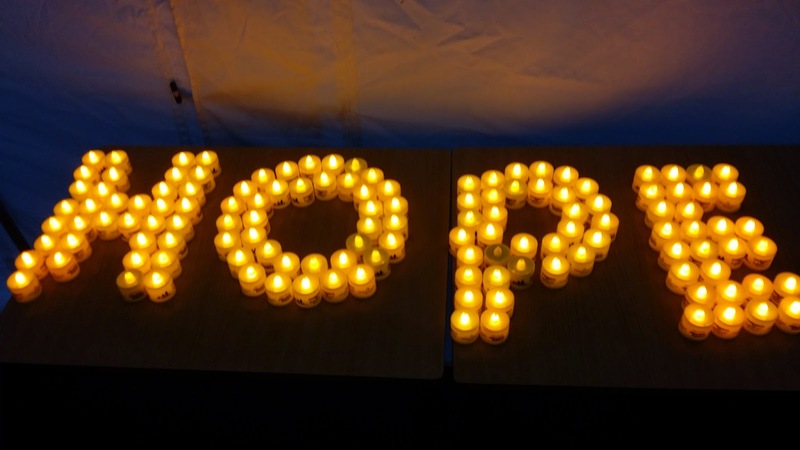 The ‘Darkness Into Light’ 5km Walk/Run in aid of Pieta House was an opportunity for the people of Dungarvan to show how much they care and are not indifferent about this situation and by God, did they show it. It was an event that was organised with military precision but enveloped by an atmosphere of kindness, compassion and empathy, qualities formed in the most powerful and strongest part of the human heart that can reach in to the darkest corner of a human mind and re-kindle hope and illuminate new and exciting pathways where previously there was only dead, dark, landscapes. The thousands that attended each individually carried their own unique reasons for being present but it was a gathering of the masses, a community fusing together in a powerful, yellow glow of solidarity and support for it’s fellow people. Niamh and Lorna and Ruairi are beacons of hope and light in a community that needs it now more than ever. It’s because of them and many others that Eric still has his path and journey of hope ahead of him. I believe the people of Dungarvan won’t allow the energy and passion witnessed last Saturday morning end there and will continue their quest to provide similar paths for those many souls enshrouded by inner darkness in their town. Jim Breen and his Cycle Against Suicide organisation have been blazing a trail of awareness around Ireland over the last fortnight. In a world where most people are trying hard to fit in but were actually born to stand out, Jim Breen is standing out, standing out from the herd of silence that exists around suicide and cycling out to the people carrying with him the magical mantra of ‘it’s ok to not feel ok and absolutely ok to ask for help’. He and his volunteers have been fanning the flames of hope for those who may feel hopeless and radiating some light for those whose life may be cloaked in darkness. One of those volunteers, Brenawn O’Connell, tragically lost his life last Wednesday in Donegal. ‘A single candle can light a thousand more’ the Buddhist saying says. Brenawn O’Connell will have touched the lives of many in ways that he will never know and he and Jim and the rest of their army of volunteers will have lit a lot of candles of hope for many thousands more. I travelled to New York recently to give a talk in Yonkers, organised by the genial Kerry woman Orla Kelleher who is CEO of the Aisling Community Centre there. It was a real eye opener to witness how the stigma around depression and emotional wellbeing issues is very strong in a country where I would have thought it to be much different. Whilst there, I gave a presentation to the Gaelic Player’s Association New York Advisory Board at a lunch organised by Teresa Ryan, wife of Peter, the deputy Irish consulate and a man possessed with dynamic energy and enthusiasm for all things Irish. It was obvious that Dessie and Donal Og have crafted a strong impression on these people of what the GPA and the GAA is about for they spoke with great respect, almost reverence, and enthusiasm about the ethos of the GAA and the skill, courage and athleticism of it’s players. These are serious and influential businessmen but after sitting in front of Miriam O’Callaghan and baring your soul live on National Television, everything else is a piece of cake after that. I wanted these people to be aware that their support of the GPA was not just about enhancing player’s sporting lives but also about saving lives. The GPA recognises how sport is probably the number one priority in it’s players lives but it has this wonderful, holistic outlook that realises there are far more aspects that encompass their members worlds than just their sport, that they wear and are more than their County jersey and how important it is to not neglect their education, jobs, relationships and inner worlds. I informed the Advisory Board of the 24 hour counselling service that is available to the GPA members. I told them the inspiring and heart warming stories of Alan O’Mara (Cavan footballer) and Niall McNamee (Offaly Footballer) who have utilised this service and are now radiating light on hitherto unspoken subjects and sharing their messages of hope that are filtering out to all members of the communities of Ireland, not just GAA members. Somebody described Donal Og as a ‘GAA capitalist’ recently but if he and Dessie and Teresa can continue to capitalise on these people’s expertise to help generate the funds needed to provide the counselling and player development services for the GPA’s members that have helped Niall and Alan and more and will help many more in the future, then I’m very enthused for them to carry on ‘capitalising’. On my journey’s and travels around Ireland to different events, I witness the growing momentum amongst our people to see and embrace change in how we are within ourselves and with each other. People are becoming more keenly aware of the urgency and necessity for real and positive change and are growing increasingly deaf to the worn platitudes of our authority figures in the country.There are more people realising that the dogmas and ways of old are no longer acceptable and more again are finding their own voice and throwing off the shackles of repression that have manacled generations of our people. The words of Mandela ring true ‘Our deepest fear is not that we are inadequate but that we are powerful beyond measure’. We need our leaders in Government, schools, churches, sporting and health organisations to harness this energy and reflect this growing momentum in their actions. The silence from our leaders in Government in the area of suicide and mental health and emotional wellbeing needs to change. It would be wise of them to call in Jim Breen, to call in Joan Freeman, to call in Siobhan Earley, people that are the living embodiment of the best qualities of the Irish people, creativity, courageous, kindness, innovative, imaginative, bold and brave. Our students don’t need to know more about maths or physics or computer science. They need to know more about themselves, be allowed to be more in touch with and express their real selves and live their own lives from the inside out. From this place, they will be far more productive, effective and happy engineers, physicists, poets, computer scientists, electricians or whatever path they decide to choose. It’s more self awareness classes they and our world needs. I was asked a really good question in America. Showing the latest research which proves that despite what we might believe, there is less violence and poverty in the world now than ever before, people are living longer than ever before and have a better standard of living than ever before, there is more groups and organisations in the area of Mental Health than ever before, this man asked why is it that suicide is increasing amongst our people? I suggested to him that perhaps the figures might be far higher were it not for these organisations but on the flight home, I wasn’t satisfied with my response. I reflected on his question and I think it’s a good question for us all to reflect on. My answer now to him would be that the challenges confronting our world in dealing with the emotional wellbeing issues of our people are vast and complex but they are challenges that need to be explored and embraced for the World Health Organisation says that by 2030, depression will be the number one health concern for human beings in the World, overtaking cancer and heart disease and all the others. That we need to look at depression and anxiety and addictions and wellbeing issues with new eyes and a new vision that reflects the incredible capacity for a human being to make sense of and find understanding and meaning in their suffering and be open to the idea that there may be a wisdom, beyond what we have yet failed to recognise as a species, contained within our internal difficulties and that they may be an invitation for growth and transformation from deep within us. I would say to him that no matter how advanced our world becomes in terms of technology, no matter how much or little money people have, no matter how long they live, the cravings of the human soul and spirit and heart will never change. The inward yearning of each human being to be valued and appreciated for their own unique and sacred presence, the desire to love whom we want to love and the desire to be loved, the longing to remove our masks and be whom we really are and not the false image we continually portray to the outer world, the aspiration to be free to express our immense vastness and limitless capabilities will always be at the core of every person you encounter. That as a species, we need to go on a deeper journey inwards and encourage the befriending and exploration of the complexity of our inner lives, to not fear our minds and soul that are full of high mountains, deep valleys and forests of the unknown. That the answers we seek may be hidden in the silent depths of these forests and that by entering these unchartered territories, we could discover fresh pathways that lead us as a culture to frontiers of new possibility and understanding in how we are within ourselves and with each other that will empower us to enrich both our inner and outer worlds for all of our people and our environment. Pieta House, the Cycle Against Suicide and the GPA have summoned their courage and ingenuity and are leading us into these forests of the unknown and for that, we can all be thankful. I wish you all well on our continued journey together into the forests of the unknown and the light of our own, real selves.